Zinc builds new commercial tech companies that tackle the biggest social challenges in the developed world. We do this through a 9-month full-time programme for 50 creative entrepreneurial individuals (we call them ‘Founders’), who come together at Zinc to find their Co-Founders and build their new businesses from scratch. Excited by technology, they are driven by the desire to use their skills, experience and energy to have a personal impact on the social issues that really matter to them. With Zinc’s help, the Founders create scalable products and services that target millions of customers, based on the best social science research, exponential technologies and creative design. Each programme has a single mission. The first mission, which we started in October 2017 in London, was to improve the mental and emotional health of 650m women and girls in the developed world. People often ask us what success would look like for a Zinc business. Well, 50 years ago, a group of social scientists, creative artists and business people focused on the mission of “mastering the addictive power of TV to do some good in the world”. The result was Sesame Street, the most-watched kids’ TV show ever across 140 countries, having more educational impact on poor minority children than expensive and scarce pre-schools, generating the $1billion Muppet franchise and still going strong. That’s the scale of social, commercial and lasting impact we aspire for in the businesses that come out of Zinc. We are very proud of the calibre of Founders on the first mission, with an equal balance of men and women, who came together from 19 different countries and combined their tech, business, creative and specialist skills to set-up 17 new businesses. You can see their businesses on the Mission 1 page. We are excited to have kicked off our second mission "to unlock new opportunities for people in places that have been hard-hit by globalisation and automation". The new programme started in London on 1st October, 2018. Why we’ve chosen this new mission. The impact of automation and globalisation on jobs and communities has dominated headlines across the developed world in recent years. There has been the political backlash from places (like the US “rust belt”) where many people feel left behind by the economic changes of the last few decades. And there is the widespread fear that the next waves of automation (like A.I.) and globalisation (like the economic strength of China) could leave behind a whole range of other people and places. In the big picture, automation and globalisation are forces of good in the world, making countries richer and improving the overall quality of life. They bring what economists call “creative destruction”, that both destroys old ways of doing things and creates the new ways. However, many people get trapped in painful and prolonged transitions, when the destruction of their jobs and ways of life happens more quickly than the creation of new and better opportunities. This is particularly tough when the place where they live and work struggles to adjust and falls behind the leaders in the global race. It leads to unequal opportunities for people in different places. Magnet cities are attracting the world’s top talent, R&D, trade and investment. Many other places fall into the middle-income trap, of being uncompetitive on cost with the developing world and uncompetitive on skills and innovation with the magnet cities. But it’s wrong to label places as winners, losers or also-rans. That suggests that the race is over. In fact, the race never stops. Many of the one-time pacemakers may have fallen to the back of the race at the moment. But others have fought their way back to the front. The order will continue to change, as today’s leaders face future setbacks, new entrants from middle-income countries join the race and today’s strugglers find fresh legs. Globalisation and technology should be helping people overcome the limitations of the place where they live and work. But that just isn’t working well enough for many people in many places. And the traumatic and protracted transitions have left too many scarred by their experiences. They need extra help to seize the future and to use the creative power of globalisation and technology to unlock new opportunities. The need for more and better solutions to help people and places adjust to, and master, economic change is urgent. These solutions have to address the legacy issues facing people and places that have already struggled to adjust, as well as help those affected in the next waves of change. Whilst much of the debate centres on what Governments should do and the importance of very local action, we believe that there are great opportunities for entrepreneurs to create commercial, affordable and global tech products which unlock new opportunities for people and places. We believe in the remarkable power of people to transform their own lives. We see them as the direct buyers of a wide range of new B2C and B2B solutions from our new Zinc Companies - in education, enterprise, healthcare, financial services, marketplaces, transport, new types of employment, housing, recreation, personal development, business growth, family support, trade and exporting, rehabilitation, etc. Given the common, and ongoing, challenges faced by hard-hit people and places across the developed world, we believe that the best tech products can scale globally in both B2C and B2B markets. Where are the hard-hit places? The pain of adjusting to automation and globalisation has been felt, and will continue to be felt through future waves of change, right across the developed world. In the places that have most struggled to adapt over the last 30-40 years, the scale and longevity of that pain has been breathtaking, e.g. since 1970 major US rust belt cities like Cleveland and Detroit have lost half of their population and their household incomes have fallen by a third. In 1970 the city with highest incomes in the US was Flint, Michigan. Today it is the poorest city. Just over half of men aged 25-54 do not have jobs. In other cases, the level of turnaround has been equally breathtaking. In the UK, for example, we can contrast the very successful adaptation of a post-industrial small city like Reading with others that are still reeling from change like Stoke. (1) Places that have adapted most quickly and effectively ( e.g. San Francisco, Hamburg, the London-Bristol corridor) but still have areas that are struggling to adjust (e.g. Barking & Dagenham in London, Rosengard in Malmo). (3) Places where progress has been much more limited. (e.g. many former coalfields like the Walloon area and smaller post-industrial cities like Youngstown). In this mission, we will focus on new opportunities for people in hard-hit places across these 3 groups. Across the developed world, that’s more than 150m people. Many countries: traditional port cities like Baltimore, Marseilles or Genoa. As well as these concentrated regions, there are many more places where local people have fewer opportunities to adjust to, and thrive through, globalisation and automation. This includes: suburbs of successful cities like London or Paris that are disconnected from the prosperity in other parts of the city; coastal resorts that went out of fashion; housing estates where people no longer choose to live; market towns where people no longer choose to shop; places where primary industries like fishing or timber have declined. Nor is it just the West that has these problems - over 100m of China’s population live in the rust belt region of Manchuria. The scale of the challenge. Our ambition is to improve everyone’s opportunity to adapt to, and exploit, globalisation and automation to achieve the best lives for themselves, their families, their workplaces and their communities. Our new businesses will create products and services that are available to everybody, as they and their places respond to automation and globalisation. But they must reduce the inequality of opportunities faced by people in the hardest-hit places. Our goal is ambitious. It is to eliminate the opportunity gap between the most successful and the hardest hit places. It is important to remind ourselves of the scale of this geographical gap in opportunities. The chances of young people doing better than their parents are often at their lowest in the old industrial areas. In the US, poor kids in the big coastal cities are twice as likely as poor kids in rust belt cities to become well-off as adults. For example, San Jose has the best social mobility in the developed world and Milwaukee has the worst. Poor kids in London are 50% more likely to do well at school and twice as likely to go to university as those in the UK’s old industrial areas. The chances of living of a long and healthy life are lower. Boys born today in the UK’s hard-hit places can expect 12 years less of healthy life and to die 6 years sooner. Working-age adults are twice as likely to be leading “limited lives” due to disability or illness. Children in deprived areas are 3 times more likely to experience multiple traumas in their childhood. With the weakening of traditional ties, chronic loneliness and isolation rates have grown sharply in recent decades, with adverse impacts on physical and mental health. Adults in hard-hit areas are 25% less likely to be in employment. Millions of people have dropped-out of the labour market, including young people who are NEETs, older people who have prematurely retired, lower rates of working women and higher rates of people on disability and sickness benefits. Those in work earn an average 30% less in wages and have less access to the best jobs in the creative, tech and financial service sectors. They are less likely to be in jobs which offer career and/or income progression. Workers are in hard-hit areas are more vulnerable to automation in the near future. A higher proportion of jobs is in the sectors on the edge of the next wave of automation, including retail, call centres, back office processing centres, warehousing and public sector transactional services. In the UK, the majority of jobs in the former coalfield areas are manual, and workers are 50% more likely to be in manual jobs than workers in London. People are twice as likely to have low levels of literacy and/or numeracy skills. Those without educational qualifications have suffered the most as traditional industrial jobs declined. People are 50% less likely to have a college degree, and the best jobs are often permanently closed to people who didn’t get a college education and/or professional training in their 20's. University students are less likely to find high-quality career opportunities in their university city and less likely to stay around after graduation. People are 3 times less likely to start a new business. Existing businesses are 30% less productive and each worker generates just half of the financial value in wages and profits. There is less R&D investment, limiting future opportunity. For example, the intensity of R&D in the South-East of England is 10 times that in Greater Manchester or South Yorkshire. Women are more likely to work in female-dominated occupations, which have low pay and limited career options (including social care, hospitality, childcare, beauty and customer service). Women are also less likely to pursue self-employment as an option. Conversely, too many men are excluding themselves from new employment opportunities in health, care and education. Opportunities can be significantly worse for black and minority ethnic people. In the US, for example, some of the highest levels of racial segregation are in rust belt cities. Chicago is a good example of the difference in opportunities for black people, as their wages have declined sharply since 2000, in contrast to wage increases for black people in some coastal cities. Even within Chicago, black youths are 5 times more likely to be out of work than white youths. Gentrification hasn’t happened in areas where 40% or more are black. Some old industrial cities have attracted higher numbers of refugees and lower-skilled immigrants, but have not always been successful at integration. People are 3 times more likely to be a victim of violent crime and twice as likely to suffer domestic abuse. Young people are more likely to break the law, and then find it harder to rehabilitate. Drug problems are endemic, and in the US made worse by the opioid crisis. People are more likely to be financially insecure. In some areas, the majority of people have virtually zero savings, low levels of insurance and high exposure to expensive credit. The commercial and social opportunities for the Founders on this mission. There is a massive consumer market for new tech products and services. For example, in the old industrial regions, the average income per person exceeds $20,000 a year, giving an annual household spend of over $3 trillion. There is a lot of momentum across the hard-hit places. And many of them are endowed with great assets, e.g. a quarter of the world’s Top 100 Universities are in the old industrial areas; many small, but advanced manufacturing plants have been retained. The biggest of the hard-hit cities (e.g. Chicago or Manchester) have had the economic diversity and population density to be more resilient than many of the smaller cities. But many smaller cities, especially those with excellent universities, have made great progress. There have been remarkable examples of regeneration in almost all of the hard-hit places, e.g. the reuse of inner city, waterfront and industrial buildings and land for new housing and employment. Large numbers of service industry jobs have been created and unemployment rates are relatively low. As part of the regeneration, most hard-hit places have an upbeat story of their progress, celebrating their hard-won victories and proudly promoting themselves as great places to live, work and visit. We can’t predict what the Founders on this programme will create. Our job is to unleash their creativity, not to constrain it. We are excited to see how they use the power of globalisation and technology to unlock new opportunities for people and places who have been hard-hit by them. We have access to deep insights from social science, into both the problems and the solutions. We are looking forward to seeing how our Founders exploit the full range of tech options, including AI, Human-Computer Interaction, AR/VR, blockchain, sensors, voice interfaces, marketplaces, social networks and mobile apps. Develop their non-cognitive skills, e.g. resilience, creativity, social skills, self-discipline. Earn more money, through better wages and, where they want it, more hours. Transform the attractiveness of struggling locations. Do you want to join this mission? 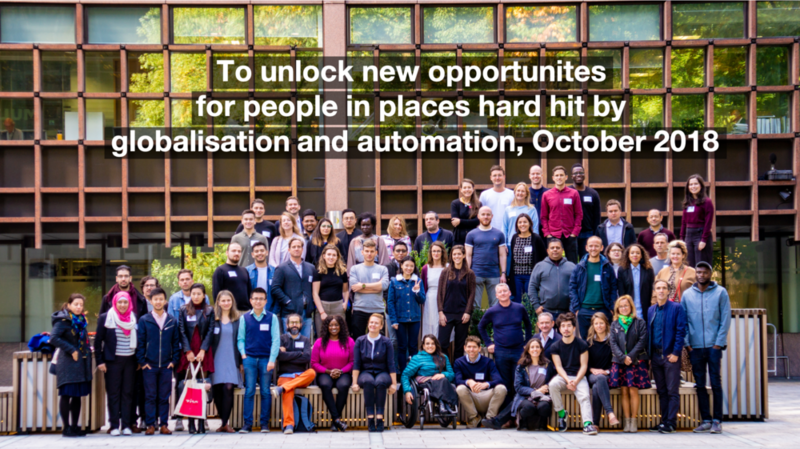 On 1st October 2018 in London, we will bring together 50 Founders from around the world with this common mission of unlocking new opportunities for people in places hard-hit by globalisation and automation. 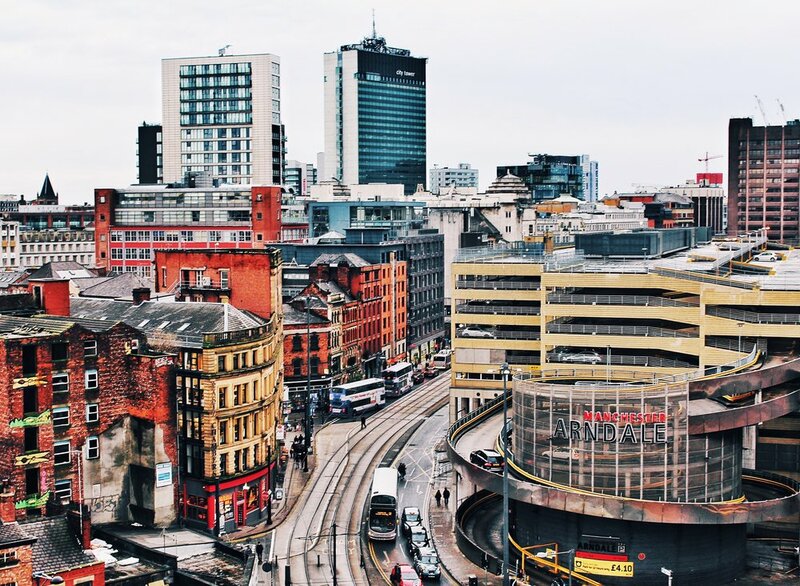 We’re bringing together people with a diverse mix of business, tech, creative and specialist skills. The businesses they build will be ambitious, using exponential tech to achieve scale and pace of impact, and innovative, shooting for the stars rather than playing it safe. The people who join the mission will have lots of skills, creativity and energy, and will be open minded about the solutions they want to create. The programme offers you the chance to: explore with experts the problems faced in hard-hit places; find your Co-Founder; design, test and build innovative and effective solutions that are loved by users; create your new business; and access investors and partners to back your vision. During the course of the programme you will develop life-changing networks and learn new skills. You will: be paid a £12K stipend in equal instalments over the 9 months; have a co-working space with your fellow 50 Founders; be supported by an intensive programme and an extensive network of distinguished experts; enjoy generous credits for tech and business services. Alternatively, could you be one of the people who helps these 50 Founders? We’re adding to our pool of experts who can help these Founders succeed by sharing expertise, insights, access to users, funding or networks. If you would like to join as an Expert, please get in touch here.